The American based computer systems manufacturing company Dell has again surprised us with its newest range of systems which house the latest Intel’s 3rd generation Ivy Bridge processors. As we know Intel recently released their Ivy Bridge processors later in April which contain 3-D transistors and are of 22nm architecture. Getting a PC with these processors will certainly future-proof you at least till the next year and Ivy Bridge also boast of a 20% performance improvements over its predecessors Sandy Bridge. Although there are only desktops available now from Dell which features Intel’s 3rd generation processors. Dell will soon start manufacturing laptops and notebooks with Ivy Bridge processors. If you want a high performance desktop right now you had better go with Dell because their prices are really cheap for the average consumer. The two desktops are the Dell XPS 8500 and the Dell Vostro 470. Here are the specs and pricing of XPS 8500 and Vostro 470. The XPS 8500 starts at Rs. 53,000/- (excluding taxes) and Vostro 470 starts at Rs. 44,900 (excluding taxes). By buying these desktops you save a lot of money on your electricity bills, hehe not really, but these processors are very energy efficient and does not consume a lot of power. A small warning for pros out there, please don’t overclock your Ivy Bridge processors as there are reports on the web that they run hot compared to the Sandy bridge processors when overclocked. Also if you like living on the Bleeding edge buying Intel’s 3rd generation desktops will certainly not be a bad choice for you! So what are your thoughts? Will you buy these chics or go with the good old Sandy Bridge processors instead, comment and let us know your thoughts. At the recent Belkin event held in Bangalore i was fortunate enough to get my hands on one of the devices at display. Here is a hands on review of the latest Belkin Retractable Mouse. Belkin has surprised us with a great collection of mices and keyboard combos. I was very much excited to test one of them and here i am with this amazing contraption. Let me list out the features of this mouse. Check out the pics i clicked while unboxing this pretty little gadget. While not being a high-end model, this mouse still grabbed my attention by its unique comfortable design. When you rest your palm on the mouse, you can feel the ease and can relax your hands perfectly. That’s what we call an ergonomic equipment, very comfortable to use. Its sleek and slim in shape. A nice polished finish gives it a smooth surface. In looks its just minimalistic, not too flashy and attractive but yet it gives you that feeling of elegance. I personally am not concerned about looks, for me its always about performance and comfortability. VERDICT: This is a great mouse for people who are more inclined towards comfortability and ease in work. It can get things done quickly. Also the retractable cable eliminates the fuss of long wires which could come in your way while doing work. The response is also good and is quite sensitive to movements. This mouse is also reasonably priced which makes it no doubt, the best buy. Also be sure to check out our on-event pics of the Belkin Product Launch by Team Chaaps. If you are happy with this review please consider leaving by a comment. Thank You. [News] Are you a victim of Computer Face? I am pretty sure you may be thinking if it is a new XSS attack on a website just like Twitter and Orkut had, but it isn’t! It is even worse! It’s a disease, a geeky disease! Being hunched over computers, women especially are sagging jaws and deep set wrinkles that are likely to show premature signs of agenting, a cosmetic surgeon has identified this phenomenon as ‘Computer Face’. If you are one of the unfortunate who has to work 24 x 7 on a computer, then you will sure end up with inevitably wrinkles. And if you work on a laptop, Mac, then it is quite true that you spend most of the time looking down, your muscles will get shorten and go saggy, may giving you a second neck! Michael Prajer, who is a botox specialist warned the problem is set to get even worse as generation grows up using computers throughout their working life. Well, we would suggest if you can leave your work for some days, then take a break or else put a mirror next to your computer so, you can see if you are frowning at screen. Seriously it is something that we can’t ignore as we bloggers also do the same and may get. What do you think? Any solution that you would like to recommend? Drop it down! Lenovo was one of the companies which started giving Facial Recognition program in their notebooks. Other brand users may have been jealous of this feature. Maybe the maker of this software were also desperate to get that feature in their PC or notebook so they designed a beautiful software which I am going to introduce to you today. Luxand Blink is a masterpiece in the history of softwares. 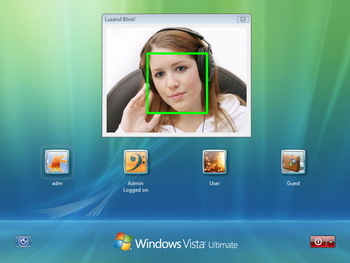 It allows you to login to your PC with your face. All you need is a web cam attached to your PC and this sweet software. Earlier Key lemon also introduced this concept but the bad bad company demanded money. I think there is a free alternative of everything in the IT world. So here comes Blink to rescue. A free 8MB application. Windows 7 and Windows Vista 32 Bit versions. Also takes picture of the person who tries to access the PC with wrong password or face. I could not test this software because I am running a 64 bit version. So It won’t run on mine PC.